One thing’s for sure, there’s nothing ordinary about Gary Baseman’s work or his new exhibition at the Skirball. Step inside the galleries, and you’re transported to another world. A world where formal distinctions between art and life, work and play, and dreams and reality lose their relevance, and creativity rules. 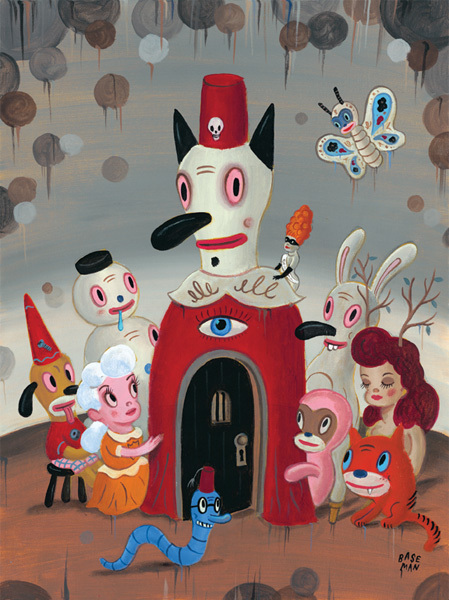 About the Artist: Gary Baseman is an internationally recognized painter, illustrator, animator, and toy designer – perhaps best known for his iconic artwork for the popular game board game Cranium. Baseman’s parents immigrated to the United States after surviving the Holocaust. They settled in the Fairfax area of Los Angeles where his mother worked at Canter’s bakery for 35 years, and his father worked as an electrician. 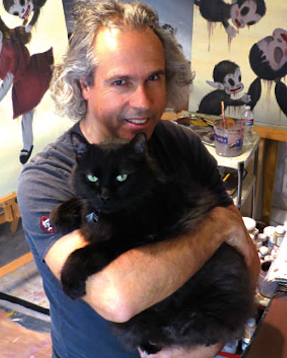 Inspired by their strong belief in the American Dream, Baseman’s parents told him he could do anything as long as “he worked hard and was a good person.” And at a young age, Gary Baseman knew exactly what he wanted to do — to draw and create art. About the Exhibition: Gary Baseman: The Door is Always Open is a thoroughly engaging celebration of creativity, family, and everything that’s important in life. The exhibition’s innovative design is fashioned after Gary Baseman’s childhood home in Los Angeles, right down to the cool wallpaper which Baseman created especially for the exhibition (detail below). Each room in the house displays the artist’s work and his personal possessions including funky thrift store finds, family photos, and actual furniture from his parent’s home (photo below). The intermingling of these personal and professional artifacts show that Baseman’s life, especially his childhood and Jewish heritage, continues to inform his artistic process. The exhibition’s title, The Door is Always Open, refers to an expression Baseman’s father would say to remind his son that he always had a home. Now Baseman is opening his home to us. “I want people to come into my home, to sit on my couch, to relax, to create, and to tell their stories,” says Baseman. That’s right, you can actually sit on the furniture and make yourself comfortable as you explore Baseman’s world. Now that’s family-friendly. The Living Room is the first room you’ll encounter. Its cozy retro décor contains Baseman’s first art studio which was his parent’s marble coffee table (photo above). When he was a child, Baseman would sit at the coffee table and draw for hours. Baseman, who never received formal training or went to art school, continues to create art in his home today. In the Art Studio (a separate gallery upstairs) you can see Baseman’s sketchbooks, works-in-progress, and create your own art. The Dining Room’s festive table is set with the Baseman family’s china and silverware (above). At first, the table reminded me of my family holiday gatherings. But after a closer look, I discovered some unusual additions like the guest list (Baseman’s characters) and an artful gefilte fish under glass. In the Hallway, my children enjoyed seeing photographs of “Toby,” Baseman’s alter ego. They document Toby’s travels around the world (photo above). In the Den, my children loved sitting on the couch and watching Baseman’s Emmy Award-winning animated television series Teacher’s Pet on a mid-century TV set (above). You can even play the board game “Cranium” on one of the room’s game tables. The Backyard in Baseman’s childhood home was a place where he played, performed, and let his imagination run wild. You’ll find a fun Super 8 film projected on a clothesline in this room that Baseman made when he was 14 years old (photo above). The Study is a somber, but incredibly moving, installation that is best for adults and teens (photo above). It chronicles Baseman’s recent trip to Eastern Europe to learn more about his family’s history and their tragic experience during the Holocaust. This room pays homage to his lost relatives, his parent’s miraculous escape from the Nazis, and his father’s extraordinary bravery as a World War II freedom fighter. The exhibition certainly inspired us to nurture our children’s creative spirit, and to encourage them to pursue their passions and to dream big. It also left us feeling grateful that we live in a time and place where our children have the freedom to do so. Exhibitions like this don’t come around often, so gather up your family and see it soon (on view through August 13, 2013). Family Guide: Pick-up a free Family Guide with a map and fun ideas to explore while you visit the exhibition. 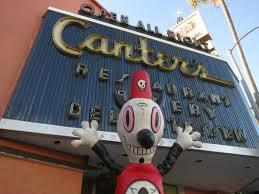 Gary Baseman did all the illustrations. Teacher’s Pet Film: See the film version of Gary Baseman’s animated TV show Teacher’s Pet. Sunday, July 14, 3:00 p.m. Ages 5 and up. Art after Dark Sleepover: Families spend the night in the museum, tour the exhibition, and make Gary Baseman inspired art together: Saturday, July 27, 6:00 p.m-Sunday, July 28, 9:00 a.m. Warning, tickets sell out quickly! Ages 6 and up. Family Art Studio: Hands-on art projects for the whole family inspired by the Gary Baseman and Noah’s Ark exhibitions. The Art Studio will be open daily during the summer (June 22-September 1) except Mondays. All ages.